An afternoon of lively discussion, sharing and debate on the question of ‘true’ collaboration between artists and communities. With leading artists Andrea Luka Zimmerman, Neville Gabie, Jasleen Kaur, Shabnam Shabazi and Julie Myers and Maria Anastassiou. 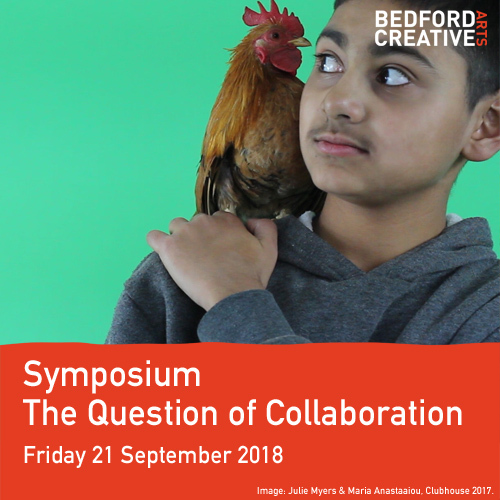 Join us this September for an afternoon of lively discussion, sharing and debate on the question of ‘true’ collaboration between artists and communities. We will be hearing from leading artists in the field Andrea Luka Zimmerman, Neville Gabie, Jasleen Kaur, Shabnam Shabazi and Julie Myers and Maria Anastassiou. Chaired by independent curator and writer Tessa Jackson OBE , with a provocation from Dr Cecilie Sachs Olsen postdoctoral research fellow at the centre for the GeoHumanities, Royal Holloway, University of London and introduced by Annie Bacon of Bedford Creative Arts, we will be seeking out and learning about new ways of developing and achieving deeper ‘collaboration’ and exploring the critical discourse around new developments and innovative approaches in socially engaged art practice. The afternoon will take into account how these approaches make artists and the communities that work with them, think and feel about the realities and possibilities of collaborative working.